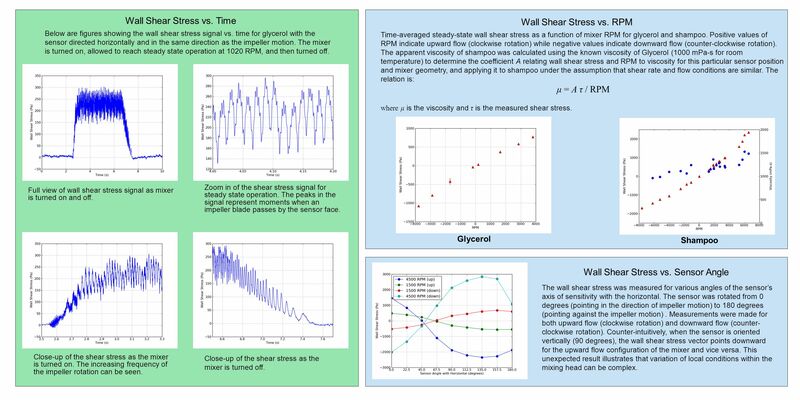 Below are figures showing the wall shear stress signal vs. time for glycerol with the sensor directed horizontally and in the same direction as the impeller motion. The mixer is turned on, allowed to reach steady state operation at 1020 RPM, and then turned off. Time-averaged steady-state wall shear stress as a function of mixer RPM for glycerol and shampoo. Positive values of RPM indicate upward flow (clockwise rotation) while negative values indicate downward flow (counter-clockwise rotation). The apparent viscosity of shampoo was calculated using the known viscosity of Glycerol (1000 mPa-s for room temperature) to determine the coefficient A relating wall shear stress and RPM to viscosity for this particular sensor position and mixer geometry, and applying it to shampoo under the assumption that shear rate and flow conditions are similar. The relation is: μ = A τ / RPM where μ is the viscosity and τ is the measured shear stress. Zoom in of the shear stress signal for steady state operation. The peaks in the signal represent moments when an impeller blade passes by the sensor face. Full view of wall shear stress signal as mixer is turned on and off. Glycerol Shampoo Wall Shear Stress vs. Sensor Angle The wall shear stress was measured for various angles of the sensor’s axis of sensitivity with the horizontal. The sensor was rotated from 0 degrees (pointing in the direction of impeller motion) to 180 degrees (pointing against the impeller motion) . Measurements were made for both upward flow (clockwise rotation) and downward flow (counter-clockwise rotation). Counter-intuitively, when the sensor is oriented vertically (90 degrees), the wall shear stress vector points downward for the upward flow configuration of the mixer and vice versa. This unexpected result illustrates that variation of local conditions within the mixing head can be complex. Close-up of the shear stress as the mixer is turned on. The increasing frequency of the impeller rotation can be seen. Close-up of the shear stress as the mixer is turned off. 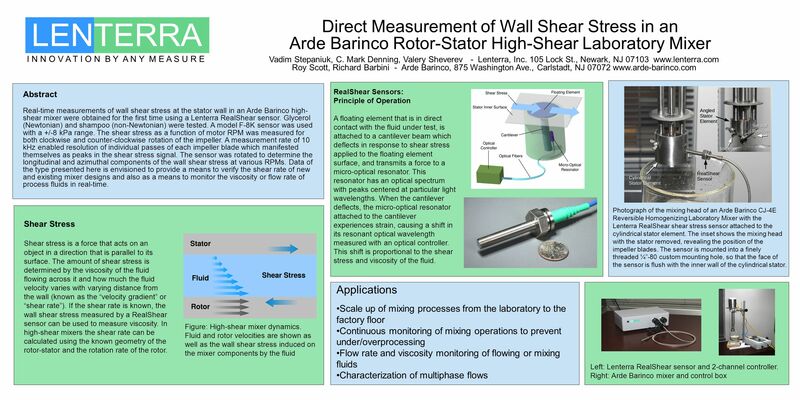 Download ppt "Direct Measurement of Wall Shear Stress in an"
Technical Investigation Department. METHOD FOR 3-D MODELLING OF A MIXED FLOW PUMP USING PHOENICS D Radosavljevic. Aula 5 Mecânica dos Fluidos 2-Estática do fluido. Rotational Motion Chapter Opener. Caption: You too can experience rapid rotation—if your stomach can take the high angular velocity and centripetal acceleration. Mechanics of Materials – MAE 243 (Section 002) Spring 2008 Dr. Konstantinos A. Sierros. Bending Moments A bending moment exists in a structural element when an external force is applied to the element so that the element bends (or wishes to. Electric Drives FEEDBACK LINEARIZED CONTROL Vector control was invented to produce separate flux and torque control as it is implicitely possible. II. Properties of Fluids. Contents 1. Definition of Fluids 2. Continuum Hypothesis 3. Density and Compressibility 4. Viscosity 5. Surface Tension 6. Vaporization. D.C. ELECTRIC MOTORS 1. Motors use the effect of forces on current-carrying conductors in magnetic fields.